Though I'm a little late jumping on the bandwagon, I finally picked up a Nintendo Wii. What finalized my decision was playing the system over at my brother-in-law's house and being amazed at the way the controllers worked in manipulating the onscreen action (depending on the game, the motion-sensitive remote can be used as a wand, a tennis racket, a sword, etc.). I was skeptical at first, but won over by the interactive nature of the games. 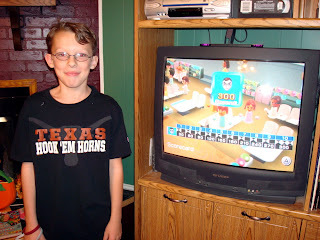 Anyone can play and enjoy the system, from the youngest of gamers to the oldest of fossils (even people older than me!). 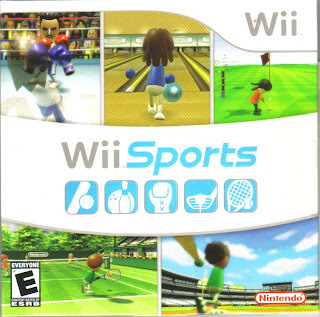 As fans of the system know, it comes packaged with Wii Sports, which is one of the best, most versatile pack-in games in the history of consoles. Boxing, Golf, and Baseball are fun, but I especially enjoy Tennis and Bowling, which seem tailor-made for the system. 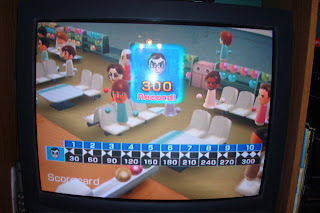 My 11-year-old son recently got a perfect 300 in Bowling, something I haven't come close to. Luckily, I'm still the king of Tennis (no, not Billie Jean King), especially the cool target game in the training mode.